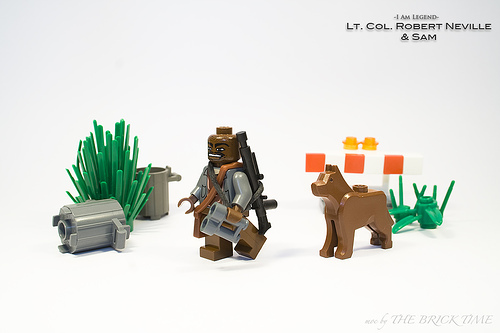 The latest from The Brick Time (mrbrickbob on Brickshelf) are the protagonists of one of my favorite recent movies, I am Legend, starring Will Smith as Lt. Col. Robert Neville, here with his constant companion Sam. Very sexah, liked the movie and like this depiction. CRAP! i wanted to be the frst to make a vig. of this moive! oh well. its good BTW. nice one. especialy the gun… it used to be from a stormtrooper! Why does it look like he’s not wearing any pants? Hey, if you were the last man left on the planet, would you bother wearing any pants? Maybe his pants were at the drycleaners when the world ended.